With few seats undeclared, Labour are on 355, down 47, the Tories on 197, up 31, and the Lib Dems on 62, up 10. Mr Howard said the party's results and campaign meant that it could now "hold its head up high". Labour's majority is predicted to drop from 167 to 66, with the party gaining 36% of votes - the lowest share of any government. The Tories took seats from both Labour and the Lib Dems, including Enfield Southgate from Schools Minister Stephen Twigg. Mr Howard said after his party's recent progress, there must never be a return to the "bickering and backstabbing of the past". "I'm 63 years old. At the time of the next election in four or five years' time I'll be 67 or 68 and I believe that's simply too old to lead a party into government. "So as I can't fight the next election as leader of our party I believe its better for me to stand aside sooner rather than later so that the party can choose someone who can. "I want to avoid the uncertainty of prolonged debate about the leadership of the party. "I want the next Conservative leader to have much more time than I had to prepare our party for government. "If we've achieved this much in just 18 months imagine what we can achieve in the next four or five years." Shadow chancellor Oliver Letwin was quick to rule himself out of the running, saying he had "no intention at all" of standing. There were changes to the process for electing a Tory leader under the stewardship of William Hague, and there is already speculation that the role of the party's rank-and-file could be reduced. Shadow minister for deregulation John Redwood refused to say whether he would be standing. Mr Redwood, a former challenger, said it was important any reforms avoiding losing "all contact with the membership". Ex-Conservative Deputy Prime Minister Michael Heseltine urged his party not to rush to a decision about the leadership. "It will take time, it will be a little messy but it will be a great deal better than another quick decision that goes wrong," said Lord Heseltine. In his speech in Putney, Mr Howard said he had tried his hardest to win the election. "I've said many times since I became leader and during this election campaign that accountability matters. "I've said that if people don't deliver then they go. And for me delivering meant winning the election." He said the party needed to debate how it would elect his successor, saying there was dissatisfaction with the rules for choosing a new leader. "I intend to stay as leader until the party has had the opportunity to consider whether it wishes those rules to be changed and if so how they should be changed," he said. "When that process is complete I shall resign as leader." He concluded: "We need to remain united, never to return to the bickering and backstabbing of the past and we need to remain positive and outward-looking." However, Labour adviser Alastair Campbell said the Tories remained "flat on their backs". 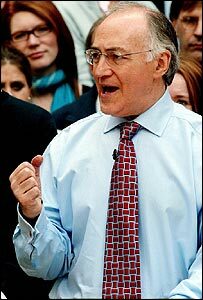 And Cabinet minister Peter Hain accused Mr Howard of leading the "most ruthlessly nasty campaign that any opposition leader has fought". "But he has made them into a more professional fighting machine and therefore a harder opponent for the Labour Party," said Mr Hain. Former Tory education spokesman Tim Collins, narrowly beaten in Westmorland and Lonsdale by the Lib Dems, said his party could have won more seats with a more positive campaign. "You have to engage with the other side on the most important issue - which is the economy." The Tories enjoyed major successes in London, including notable wins in Croydon Central, Putney and Enfield Southgate - famously lost by Michael Portillo in 1997. Putney provided the first Conservative win of the night, with finance manager Justine Greening overturning Tony Colman's 2,771 majority to win the seat by 1,766 votes. The Tories unseated Constitutional Affairs Minister Chris Leslie in Shipley and Health Minister Melanie Johnson in Welwyn Hatfield. Tory frontbenchers Theresa May, Oliver Letwin and David Davis all thwarted the Lib Dem "decapitation strategy" aimed at toppling them. The Lib Dems also inflicted Conservative losses in Taunton and Solihull. The Conservatives lauded the election of their first black MP, Adam Afriyie in Windsor, as well as an Asian MP and more women. The Conservatives have gained a foothold in Wales by winning Monmouth, Clywd West and Preseli Pembrokeshire from Labour. A surprise victory in Dumfriesshire saved the party from a complete wipe-out in Scotland. 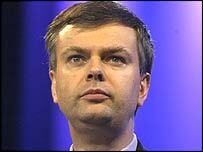 Peter Duncan, the only Tory MP in Scotland in the last Parliament, failed to win in Dumfries and Galloway. In 2001, the Conservatives won 166 seats, just one more than their showing four years earlier.